Becoming a mother and blogging has really taken me out of my heavily guarded comfort zone. I’ve dipped my toes in the deep dark sea that is web design, cooked/baked fruits and veggies I’ve never even tried eating before and pushed my own fears aside to do things that were in my son’s best interest, but there comes a time when everything needs to stop, even if it’s only for a brief moment. And even though the elusive mommy brain makes us think we can do five loads of laundry, bake a pie, write a blog, walk the dog, cut the lawn (who am I kidding I don’t cut the lawn) and finish a 600 page book club book all in one day, sooner or later we all have to realize that we are not the energizer bunny and this is NOT all possible. Accepting this is the hardest part and the act of doing nothing really is harder than it seems. So this past week we decided to ditch the to- do list and take a much needed trip up to the family cottage in the Kawarthas. The original plan was to embark on a more intense family trip to either the UK (to visit my best friend and her little one) or to BC, as both my husband and I are dying to see the west coast. I’ve been hooked on this “big baby trip” for a while (convinced that I needed to take a trip with our baby before my mat-leave was over). But with baptism planning and the stress of trying to organize a complex trip with a seven month old, we soon realized that this was not the best time for a “big trip” and boy am I happy we waited. Instead we chose to just relax and unplug in a calm and familiar place. 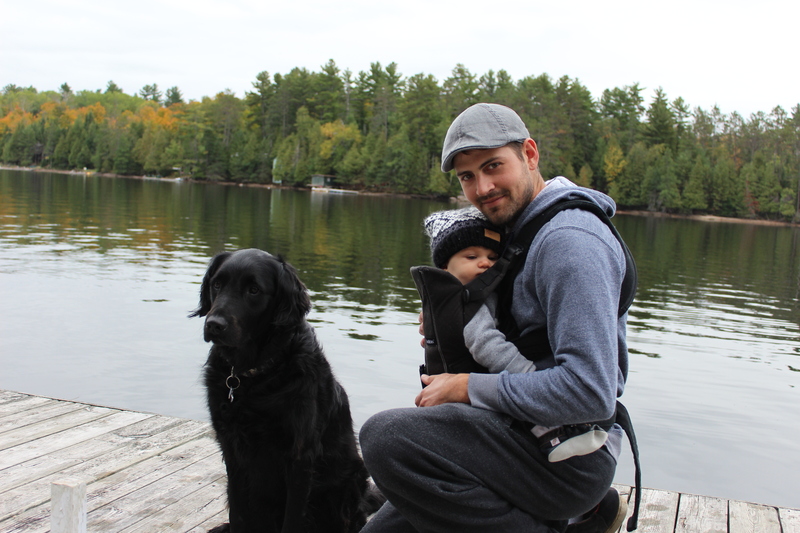 Autumn on the lake is absolutely stunning, the days are still warm (so you can enjoy some time on the dock soaking up the sun) and the nights are cool, which makes for a very comfortable sleep and very few bugs. The colourful trees frame the road and light up the shoreline with deep reds, burnt oranges and vibrant yellows; a parade of autumn floats dancing in the breeze. The beauty of this place demands to be seriously savoured, something that can only be done if you stop moving, close your laptop and look up from your phone. While I have become very interested in the world of social media and blogging over the past few months and have connected with some amazing people through this virtual community, it can become a bit overwhelming and all consuming at times. I literally find myself lost in cyberspace (even in public places). The online world does have a way of sucking you in, tightening the straps and taking you along for a fast ride. This past week gave me a chance to stop swiping, double tapping and typing for a bit, a chance to look at the world first hand and enjoy. Sure there were moments when I felt like I was “missing out” on things, but I was ok with that. After this much needed break I’ve realized that it’s ok for the world to keep turning even if I’m standing still. As a newbie mom and blogger I have a lot to learn about balance, something that I am sure I will have to re-learn once my mat leave is over as well. It’s no wonder the mommy blog and instagram world is filled with posts about the delicate balance that we need to find in order to pursue goals, be present and live in the moment. While these ideas might seem like new ones, I think this concept of balance might be something that was established long before our time, long before the world was open for business 24-7. The value of rest and the the act of doing nothing, the dolce far niente, is something that has been imprinted into our calendars but somehow erased from our modern experience, there are actually days dedicated to rest where to-do lists, work and all things stressful can be put on hold. So, after learning how important it is to unplug and how truly sweet it is to do nothing, I am going to make more of an effort to do this at least once a week. And even though the world might be spinning and open for business 24-7, because this is our modern experience, I will embrace the fact that I am standing still.